It's tough to win when you don't score any runs. The Red Sox were held to just three hits, and didn't get a runner as far as second base until the ninth inning, as they fell to the Rays 1-0 at the Trop on Saturday afternoon. 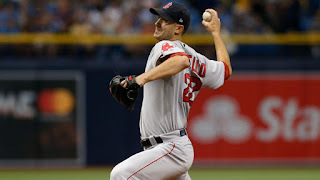 Rick Porcello (pictured) took the loss despite one of his best performances of the season. The lone run he gave up came on a sacrifice fly in the bottom of the second inning. Alex Cobb shut Boston out on just two hits over 7.2 innings. He walked one and struck out three for his seventh win of the year. Boston's only really chance to score came in the ninth. Xander Bogaerts worked a one-out walk, followed by a Mitch Moreland double. After Hanley Ramirez struck out, Andrew Benintendi was intentionally walked to load the bases and Rays closer got Chris Young to pop up to end the game. It's the ninth time this season that Porcello has received zero run support from his teammates. He scattered six hits and struck out seven while not walking a batter. His ERA dropped to 4.75.